Working as a journalist for a community paper has proven to be a wide and varied creative experience! It’s rare to have an interview with a puppeteer! Rare and magical, it immediately brings out the child in you! Brett Hansen gave us a demonstration of his incredible gifts as we watched in awe and fascination! Brett has just returned to the island from New York and was gracious enough to share his experiences with us. Brett attended the ‘Beyond the Sock Workshop’ featuring puppetry teachers: Marty Robinson (a Jim Henson puppeteer famous for performing Telly Monster and Mr. Snuffleupagus on Sesame Street), Pasha Romanowski (puppet builder who made the characters on popular New Zealand show, The Moe Show), and Noel MacNeal (a Jim Henson puppeteer famous for performing the lead character on Bear in the Big Blue House). He held a solo puppet show at the Puppetry Arts Festival of Brooklyn – an annual festival in New York celebrating all kinds of puppetry. “I had a really big crowd on the day”. His main character Troggg (that’s Troggg with three Gs, the middle G is silent) – is pictured here posing with New York puppet troupe ‘Team Lopez’. 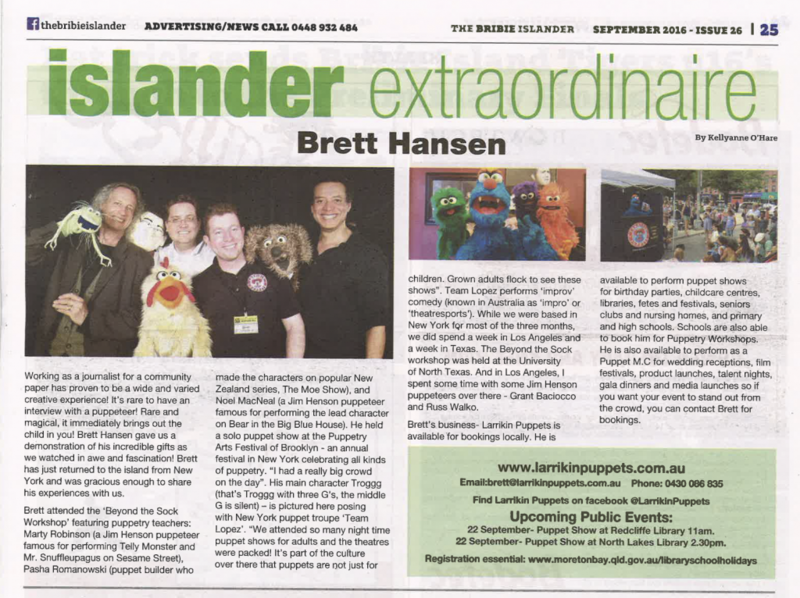 “We attended so many night time puppet shows for adults and the theatres were packed! It’s part of the culture over there that puppets are not just for children. Grown adults flock to see these shows”. Team Lopez performs ‘improv’ comedy (known in Australia as ‘impro’ or ‘theatresports’). While we were based in New York for most of the three months, we did spend a week in Los Angeles and a week in Texas. The Beyond the Sock workshop was held at the University of North Texas. And in Los Angeles, I spent some time with some Jim Henson puppeteers over there – Grant Baciocco and Russ Walko. Brett’s business Larrikin Puppets is available for bookings locally. He is available to perform puppet shows for birthday parties, childcare centres, libraries, fetes and festivals, seniors clubs and nursing homes, and primary and high schools. Schools are also able to book him for Puppetry Workshops. He is also available to perform as a Puppet M.C. for wedding receptions, film festivals, product launches, talent nights, gala dinners and media launches. So if you want your event to stand out from the crowd, you can contact Brett for bookings. Article by Kellyanne O’Hare in The Bribie Islander. Issue 26, September 2016. This entry was posted in 2016, Australia, Bear in the Big Blue House, Bellara, Beyond the Sock, birthday parties, Bongaree, Bribie Island, Brisbane, Brisbane Powerhouse, Caboolture, child care centers, childcare centres, children's entertainment, daycare, Denton, festivals, fetes, Film Screening, Grant Baciocco, Happiness, Henson, Impro, Improv, Jim Henson, kids' entertainment, Larrikin Puppets, Larrikin Puppets News, Library, Los Angeles, Manhattan, Martin P. Robinson, Marty Robinson, Muppets, New York, New York City, Newspaper, Noel MacNeal, North Lakes, North Texas, NYC, Pasha Romanowski, public puppet shows, Puppet MC, Puppet Shows, Puppeteer, Puppetry, Puppetry Arts Festival of Brooklyn, puppetry workshops, Redcliffe, Russ Walko, Sesame Street, Small Business, stage show for kids, Stage Shows, Team Lopez, Telly Monster, Texas, The Bribie Islander, The Jim Henson Company, The Muppet Show, The Muppets, Theatre, Troggg, Troggg the MC, TV, University of North Texas, USA, Wedding, Woorim, workshops by Brett. Bookmark the permalink.